To various degrees of success, four European nations participated in the colonisation of North America: Spain, France, Great Britain and Holland. In the second half of the 18th century, the British had obtained control over the most territory on the American East Coast, but they had to face rising discontent from the 13 colonies. In April 1534, Jacques Cartier left Saint Malo and sailed westwards. King François I of France had given him a commission to find a northern maritime route providing access to China and to discover islands and countries ‘rich in gold’. European exploration of the Mississippi River began with the travels of Jacques Marquette and Louis Jolliet in 1673. In 1682 René-Robert Cavelier de la Salle reached the river’s delta and took possession of the regions he had crossed in the name of the French King: Illinois and Louisiana. 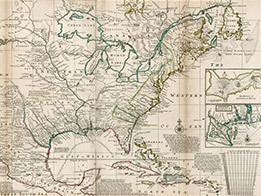 European settlements in Nouvelle-France experienced limitations in the regions around the St Lawrence Valley, Ile Royale and New Orleans. Areas on the outer edges of these settlements saw an increase in their population due to the growing presence of trappers as well as a lucrative trade in furs. In 1606, King James I issued a Colonization Charter for two limited liability companies: the London Company and the Plymouth Company.